September 2018 has brought our area a lot of rain, and it looks like there’s still more to come! Does it seem like the alarm on your aerobic system turns on every time it rains? If so, here are a few pointers. Don’t panic. It’s likely that some rainwater entered the tank through the seam of the lid(s), and the system may just need some time to spray out. Silence the alarm using the silence button. The light will stay activated until the issue is resolved, but you won’t have to listen to it. Wait overnight to see if the light turns off. If it does not, call your maintenance provider. If it does, push the silence button again to take the buzzer off of the silent mode. 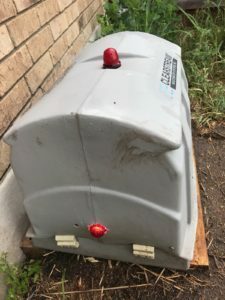 If you think that rainwater may be entering through the seams of the lids, you could add height to the riser to bring the lid further from the surface of the ground and/or prevent rainwater runoff from running over the tanks by diverting the rainwater. Still have questions? Our technicians are happy to help! Give us a call at 210-698-2000 for professional, friendly service.